These pickles probably originate in Russia, where Grandma Minnie is from. Minnie’s son Harold carried on the tradition by making them with his wife Barbara, until she passed away on March 4th, 2013. They would make pickles at least once a year. Harold’s daughter Karen started making the pickles too, and in the DIY spirit, her daughter Sydney decided to give away jars of homemade pickles at her wedding to Will in August 2013. Harold came into town specially to help Sydney and Will make 140 jars of pickles. Learn more about this wonderful family and the pickle story here! 1. 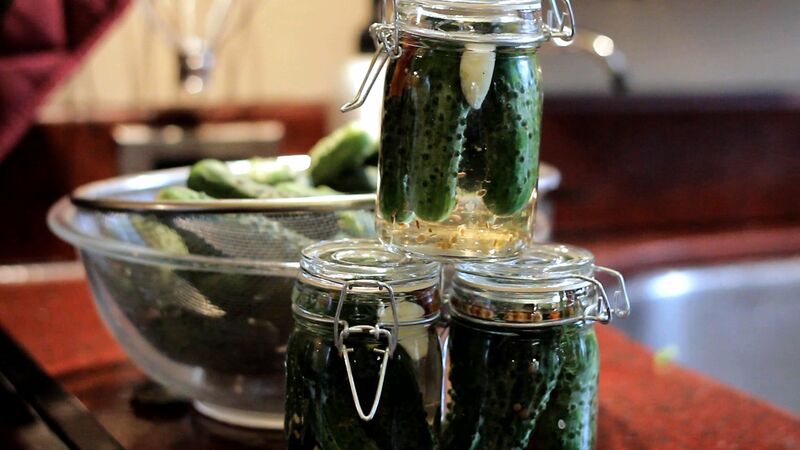 Pack cucumbers and spices into sterilized jars. 2. Fill the jars to the top with cold water, screw on the lids and turn upside down. 3. The next day, check for leaks, tighten the lids as needed and turn right side up. 4. Let the pickles rest for at least two weeks before testing them. 5. Refrigerate the pickles after opening. Enjoy!